Back in high school, Elise and I shared many math classes together. We were pretty good at it, and we actually enjoyed the subject quite a bit. We weren’t shy about this fact either. Anyone who knew us, knew we got on with it pretty well. They also knew that Elise had the first 50 (at least) decibels of Pi memorized. She was the Pi queen if there ever was one. I remember when I was first introduced to the golden ratio in design school. I was already vaguely familiar with it, because of my early love and admiration of Leonardo da Vinci. But with this new ‘formal’ study of the subject, I became obsessed. My first few logos were all designed to the golden ratio. I began seeing it everywhere. I love this connection back into nature—I love how mathematical and consistent it is. Yet how imperfect it is, too. It feels like a deep-routed secret of life, which Mother Nature only holds the true understanding of. As this piece is continuing the story of my previous blue-8 piece ’Nature’, I felt I had no other choice but to bring in some mathematical element as the [square] root (ha-ha) of the concept. After much thinking, I decided on the Fibonacci series. I started by drawing a grid across a large A2 sheet of thick paper. Then, I drew a set of circles from multiple corners of the page, all who’s radius expands following the Fibonacci sequence. 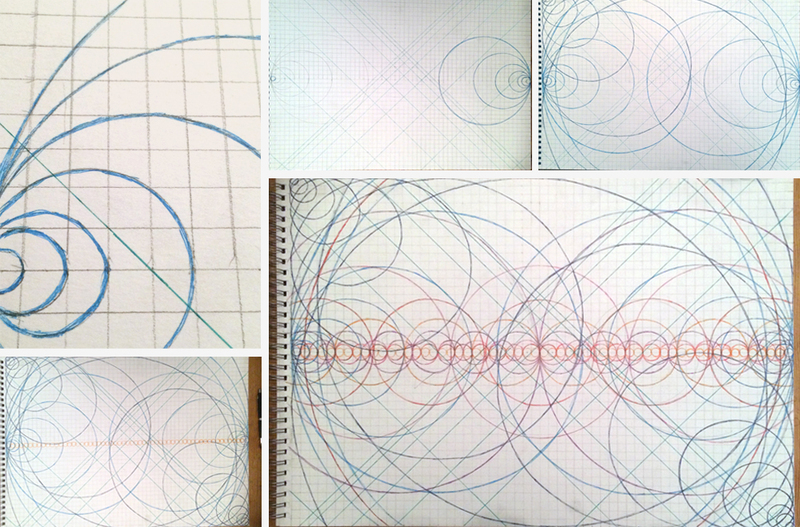 Each set of circles and lines I drew in a different colour, to keep the connection between each series linked. 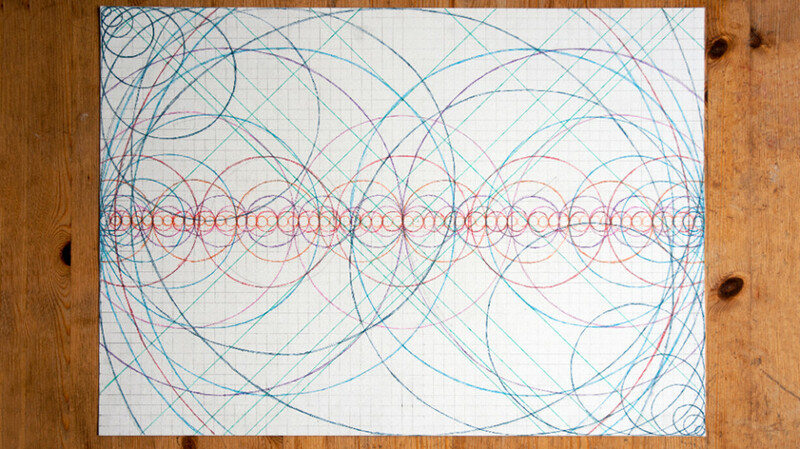 I drew the circles in with a rough pen, to articulate the slight imperfections we find in the objects in nature which follow these mathematical sequences. I didn’t want to lines to be perfect. If I were finishing this piece, I would have next erased my grid and all my pencil lines. But I kept them in for Elise, so she can decide how she will finish it. I also think the grid lines are what will help give a clue to the actual series. This one feels like it would be easy for her to guess, but we’ll see if she does or not!